Founded at the San Francisco Conservatory of Music, Avenue Winds embodies that institution’s spirit: bold, engaging, passionate performances in recital, house concert, and informance settings. Avenue Winds takes you on an emotional journey exploring the musical joys of the woodwind quintet. 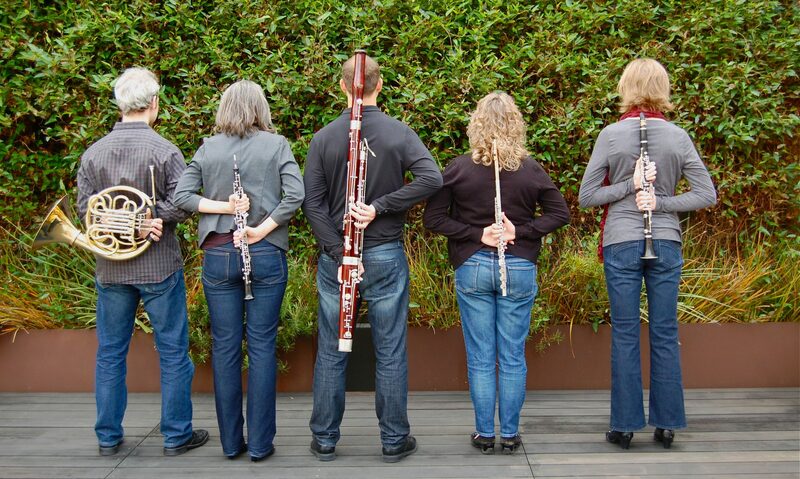 Performing with artistry and virtuosity, this engaging woodwind quintet has performed in recital at numerous venues, including the San Francisco Conservatory of Music, University of San Francisco, Berkeley Chamber Performances and the Old First Concert Series. Avenue Winds engages audiences of all ages with dynamic chamber music performances featuring new works by local San Francisco Bay Area composers as well as the classics of the woodwind quintet repertoire. Family-friendly concert of traditional woodwind quintet repertoire including works by Taffanel, Reicha, and Ibert. Avenue Winds can provide the perfect aesthetic backdrop for your special event with a collective repertoire of festive, ceremonial, classical, holiday, themed, pops, and wedding chamber music for every occasion. These five virtuosic musicians provide exquisite background music to suit any occasion, or can take center stage with warm, captivating and memorable performances for your guests. Avenue Winds has received accolades for its imaginative and innovative programming of a repertoire that spans from the classic gems to the latest works by living composers. As well-seasoned performers on the concert stage, members of the group establish an intimate setting and warm rapport with their audience through eloquent, informative, personal and often humorous commentary on performance pieces. No matter the occasion, Avenue Winds charm audiences large or small with their delightful performances. As master teachers with years of experience and expertise, Avenue Winds present high quality and imaginative educational and family concerts, workshops, master classes and seminars to audiences of all ages every year. Weddings, Anniversaries, private parties and celebrations of all kinds, with an expansive repertoire of ceremonial and background music. Special musical arrangements available upon request. Corporate events, lunchtime concerts, private functions. Fund-raisers, benefit concerts, art and museum exhibit openings. Educational concert programs for groups of all ages. Live house concerts and performances for groups and community organizations. Quintet, Duo, Trio, and Quartet instrumentations available. For bookings, availability and further information, please email us at avenuewinds@gmail.com. Victoria “Tori” Hauk, flutist, originally from San Diego, has been performing and teaching in the Bay Area since 2013. She is an avid chamber musician and can be seen performing with groups including: unconducted chamber orchestra One Found Sound, The Fête Concert Series, newly formed flute duo Siroko Duo, woodwind quintet Avenue Winds, and Stockton Symphony. She teaches privately and at Young Musician’s Choral Orchestra, Albany Music School, Little Mission Studio, and Scherzo Music School. She is the winner of the University of Arizona President’s Concerto Competition and Arizona Flute Society Competition. Tori is also an award winner of the Musical Merit Foundation of Greater San Diego, MTNA Southwest Regional Competition, and has received the Presser Foundation Award. She received her Professional Studies Diploma at the San Francisco Conservatory studying with Tim Day, M.M. at Lynn Conservatory studying with Jeffrey Khaner and Renée Siebert, and B.M. at the University of Arizona studying with Brian Luce. Adrienne Malley, oboe, is a freelance performer and instructor in the Bay Area. Adrienne enjoys performing with many ensembles including the San Francisco Symphony, and the symphony orchestras of Berkeley, Monterey, Napa Valley, Oakland East Bay, Santa Cruz, and Santa Rosa. She received her Bachelor of Music degree from the University of Michigan, and her Master of Music degree from the University of Cincinnati, College-Conservatory of Music. Her principal teachers have included Nancy Ambrose King, Mark Ostoich, Harry Sargous, and Shelley Heron. In addition to Avenue Winds, she is also a founding member of Frequency 49, a woodwind sextet, and a past member of the Divisa Ensemble, a chamber ensemble comprised of mixed wind and string instruments. Ginger Kroft is Principal Clarinet of the Sacramento Philharmonic and the Carmel Bach Festival. She is a member of the Oakland East Bay Symphony, as well as an extra with the San Francisco Ballet. In addition, she has held positions with the California, Monterey, Santa Cruz and the Bridge Players, the ADORNO ensemble and the Worn Ensemble. She holds degrees from Northwestern University and the San Francisco Conservatory of Music. Ms. Kroft is a Vandoren International Artist and performs on M13-lyre mouthpieces and Traditional reeds. She is also a faculty member at Santa Clara University and maintains a pre-college studio. Daniel Wood, horn, is a performer, composer, educator and musical entrepreneur. Prior to joining Avenue Winds, he received his musical training from the University of California, Los Angeles. He is the chair of Musicianship and Composition at the San Francisco Conservatory of Music, Preparatory Division. His music favors small ensembles, including brass, wind and string chamber music, steel drum ensembles and jazz combos with commissions from Avenue Winds, CSMA Brass, and members of the St. Louis Symphony Orchestra. He is also a member of Quadre – The Voice of Four Horns and has performed over 1,000 concerts with them and composed for their 4 albums. He writes and performs solo shows as an improvisational musician. As a freelance musician, he has played with chamber ensembles, symphonies, opera & ballet companies and new music groups. Daniel lectures on the “Business of Music” and runs Solid Wood Publishing, offering over 150 titles of horn music. He is the Northern CA rep. for the International Horn Society. Daniel MacNeill joined the San Francisco Opera Orchestra in 2012. He began studying bassoon at the age of 13 in South Dakota where he grew up. From the age of 15 he performed regularly with the Black Hills Symphony alongside his first teacher, Mary MacPhee. He received his diploma from Interlochen Arts Academy while studying with Barrick Stees and went on to study with Judith LeClair at the Juilliard School. Daniel served as Associate Principal Bassoon in the Hawaii Symphony’s 2012 inaugural season as well as the Honolulu Symphony from 2004-2006. He has also performed with the San Francisco Symphony and Ballet as well as the Utah Symphony under Keith Lockhart. He was recently a finalist for Principal Bassoon of the Metropolitan Opera and the St. Louis Symphony. Summer festivals Daniel has attended include the Aspen Music Festival, National Repertory Orchestra, The Spoleto Festival Italy, Kyoto International Music Festival Japan, Kent-Blossom Chamber Music Festival, and Interlochen Arts Camp. Daniel is on faculty at San Francisco State University and previously served as instructor of bassoon at Punahou School from 2007-2012. Daniel would also like to thank The Mr. Holland’s Opus Foundation for their generous gift of a new bassoon in 2000.